Now the crowd is enjoying an intermission as we learn about the different fighting styles we will see tonight: Karate, Kickboxing, Kung Fu, Grappling and “Exotics” (secret ninja attack!). We also get highlights from a couple of first-round bouts. Johnny Rhodes outslugged fellow American David Levicki with the help of a headbutt to the eye. Orlando Wiet of France nailed Robin Lucarelli with a devastating knee to the face en route to a TKO win. Scott Morris is an American ninja who used a guillotine choke to beat Sean Daugherty in 20 seconds to advance through the first round. Smith is Denver’s hometown hero who lost to Ken Shamrock at UFC 1. This time around, he tasted victory over Ray Wizard via guillotine choke in a first-round battle that lasted just under a minute. Smith clobbers Morris with forearms to the face, takes the mount and elbows Morris into oblivion in 30 seconds. So far, things are going great for Smith and his Denver fans. Rhodes’ win over Levicki was the “longest fight in UFC history,” the announcers note, at 12 minutes. Of course, there were no rounds back then. Ettish replaces Dutch fighter Frank Hamaker, who hurt his arm while beating American Thaddeus Luster in the first round, when Luster’s corner threw in the towel just before the five-minute mark. Ettish is one tough dude, as he eats some knees to the face from Rhodes before finally tapping out to a choke. He even reappears like a ghost behind Rhodes during the post-fight interview. Weit went less than three minutes in his win over Lucarelli, while Pardoel battled Alberto Cerro Leon of Spain for almost 10 minutes before putting him away with an armlock. Pardoel’s strategy consists of plopping his weight onto Wiet and trying to bend his right arm until it breaks. This goes nowhere until Remco realizes that from this position, he can elbow Weit into La-La Land. The towel comes in, but Weit was out anyway. Jason DeLucia won an alternate bout at UFC 1 over Trent Jenkins and upped his record to 2-0 with a first-round win over Scott Baker by submission to strikes in less than 7 minutes. DeLucia actually gains top position on Gracie, but Royce calmly pulls guard, floats over and secures an armlock. DeLucia is standing up as he taps out. Jim Brown says Smith is going to win. He’s a Pro Football Hall of Famer, so who am I to argue? After a boxing stalemate, Smith backs Rhodes into the cage, then locks on a guillotine and chokes him out. Always listen to Jim Brown. Gracie is giving up 84 pounds, so it takes a long time to bring Pardoel down, but he finally does. Pardoel tries for a kimura, but Gracie uses the gi to choke the big man out. Remember: there are no rules! It’s the fourth fight of the night for each man. The fans are chanting for Smith. Now before this fight starts, what should Smith do to solve the Royce Gracie riddle? I say that since Gracie has proven that he can take almost anyone down, Smith should go full guns a-blazin’ with punches and kicks. Make Gracie beat him with punches. Well, that's what happens. After stuffing Smith’s initial attack and taking him down, Gracie takes the mount, lands a few punches and here comes the towel. Huh? At first, the corner stoppage seems premature, but on replay, you could see that Gracie had a mount locked in and was just going to punch Smith in the head all night long. So the towel toss was the right move. Gracie and Smith give each other hugs and respect, as the Gracie family comes into the Octagon to celebrate. 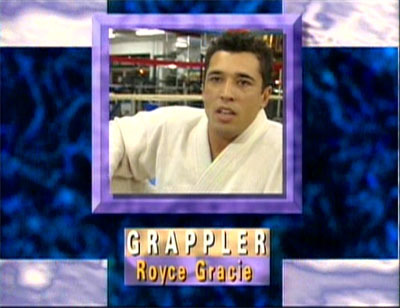 The big check (which was made out to “The Ultimate Fighter!” at UFC 1), is filled in with Royce Gracie’s name. This will avoid an awkward moment at the bank. Gracie calls out some more tough men to challenge him. Fun show, and the question moving on at this point is: Can any fighter stop Royce Gracie?